Tag line: "Winner takes all!" I admit I was a little apprehensive to re-watch 1979’s Scavenger Hunt, a wild and crazy film that I hadn’t seen in about 35 years. It was a cable favorite of mine back in the early ‘80s, but as I recalled the comedy was extremely broad, and I knew there was a strong possibility it wouldn’t hold up well. But with its impressive cast, plus a number of high-profile cameos, I figured Scavenger Hunt might just be worth the risk. Millionaire gaming tycoon Milton Parker (Vincent Price) has died, but instead of leaving his estate to his various next-of-kin, he sends his would be heirs off on a scavenger hunt, the winner of which will receive his entire fortune. In all, five separate teams take part in the contest: 1. Parker’s sister Mildred Carruthers (Cloris Leachman), who is joined by her attorney Stewart Sellsome (Richard Benjamin), and her son Georgie (Richard Mazur); 2. Nephews Jeff (Dirk Benedict) and Kenny (Willie Aames), who are assisted by Mildred’s kindly stepdaughter Lisa (Maureen Teefy); 3. Son-in-law Henry Motler (Tony Randall) and his four young kids (Julie Anne Haddock, David Hollander, Shane Sinutko and Missy Francis); 4. Parker’s most trusted servants: valet Jenkins (Roddy McDowell), limo driver Jackson (Cleavon Little), cook Henri (James Coco) and maid Babbette (Stephanie Faracy); and 5. Marvin Dummittz (Richard Mulligan), a feeble-minded taxi driver who once did Parker a favor. Each group is given a list of identical items to retrieve, and have until 5 p.m. to collect as many as they can, by any means necessary (short of actually buying them). With Parker’s lawyer Charles Bernstein (Robert Morley) officiating, the teams set off on their quest, and with $200 million on the line, you can bet that nothing, not even the law, will stand in their way! 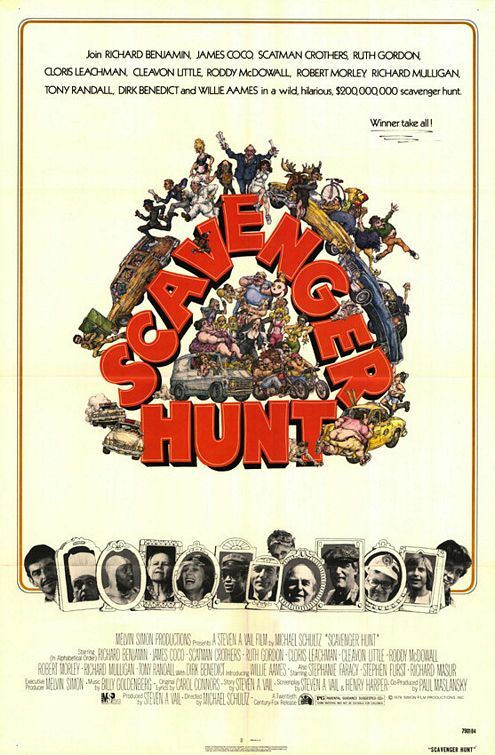 Directed by Michael Schultz, Scavenger Hunt follows the same basic formula as 1963’s It’s a Mad, Mad, Mad, Mad World: assemble a collection of well-known comic actors and put them in a situation where their character’s greed pushes them to do outlandish things. Some of the “hunters” are more interesting than others; Dirk Benedict’s group has a few humorous scenes, as does Tony Randall and his 4 kids, but both are overshadowed by the remaining three teams, my favorite being the servants, who get into the zaniest predicaments (their attempt to steal a cash register from a convenience store is particularly funny). And like Mad, Mad World, there are some great cameos in Scavenger Hunt, including rock star Meat Loaf (as the leader of a biker gang), Ruth Gordon (a sweet old lady who just happens to own a bullet-proof vest, a grenade, and brass knuckles), Avery Schrieber (a zoo keeper with a pronounced lisp), Scatman Crothers (a security guard who teams up with Dummittz), the legendary Vincent Price (as the deceased, Milton Parker) and even Arnold Schwarzenegger, a few years before he became one of the cinema’s biggest box-office draws (playing Lars, the lead trainer at a local gym). 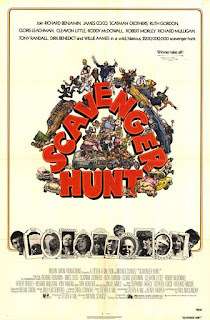 Scavenger Hunt is, for the most part, a very silly film: there’s a lot of physical humor (everything from slapstick to car chases) and the characters are all exaggerated and over-the-top (especially Cloris Leachman as Parker’s loudmouth sister, and Richard Mazur as her dim-witted son). But if you’re a fan of It’s a Mad, Mad, Mad, Mad World, odds are you’ll have a good time watching this movie as well.